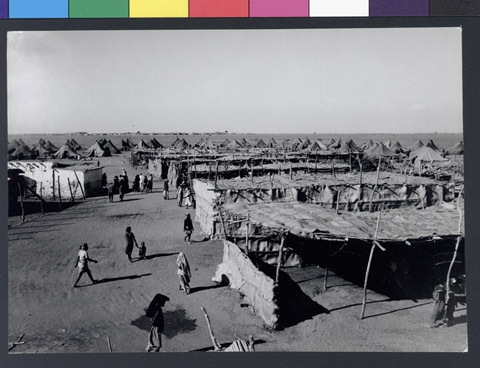 Description Aden, 1950; Operation Magic carpet; Yemenite Jewish refugees in JDC transit camp prior to their airlift to Israel; overall view of camp showing temporary structures, the British would not allow construction of permanent looking structures. New streets of tents (66) erected by Dr. Elkanah in transit camp "Geulah", Aden. Each accomodating 2 people, their children and possessions, scattered outside in the daytime heat and the nighttime frost.Same image as: NY_28997.